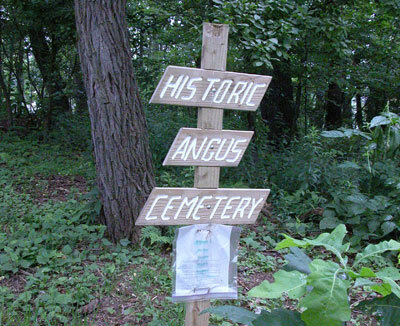 There are very few tombstones left at Historic Angus Cemetery (summer of 2004). While the cemetery seems to have fallen onto "hard times", it also looks like someone is starting the repair of some of the damage. The area has been cleared. Remaining tombstones have been propped up against trees and possible burial locations have been marked with sticks. From Rte. US-22, take PA-271 South towards Conemaugh. Turn left just before the Dairy Queen. Cemetery is located in the woods at the corner of Echo and Chris Sts.